If your golf weight training routine is getting old, adding these BOSU workouts for your upper body will be a great way to mix things up. BOSU balls have a wide variety of uses not only for the upper body but for your legs and core as well. Every targets part of your body will take advantage of the instability that a BOSU ball provides. BOSU workouts can be fun and challenging! 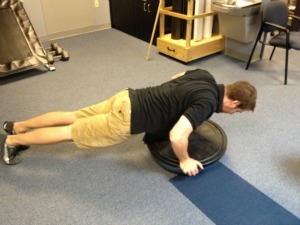 One of the best things about using a BOSU is that you can be creative and make your own exercises. Many traditional exercises can be made harder just by adding a ball. 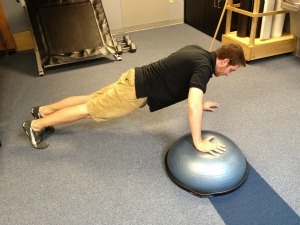 -Start with the BOSU platform side up. -Grab either side of the platform, move your feet away from the ball so that you are now in the plank position with your elbows locked. -Now perform a pushup, while trying to keep the ball level. This also can be performed but the ball side up. -BOSU will be oriented dome side up. 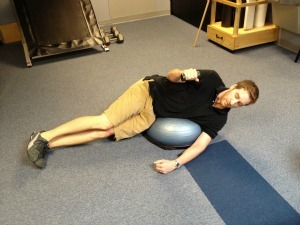 -Lie on top of the ball with chest down and legs extended behind you for stability. -Grab light weights, and start with your shoulders elevated to the side (T pattern), elbows at 90 degrees, and forearms perpendicular to the ground. -Rotate at your shoulders so that your forearms are now parallel to the ground. 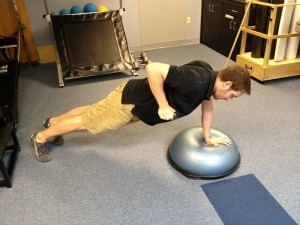 -Start with your body in the pushup position, and the BOSU ball, dome side up, beside your right hand. -Start by moving your left hand to directly beside your right. Lift your right hand off of the ground and place in on top of the dome. -Now raise your left hand and put it by your right, so that you have both hands on the ball. -Lift your right hand off and place it on the ground, followed by your left hand. -Repeat by now moving back over the ball, leading with your left hand. -The BOSU can be oriented in either position for this exercise. -Place your left hand on the ball, elevate your body off of the ground with your legs and left arm straight and feet about shoulder width apart. -Your body weight is supported at three points, your left hand, and through both feet. Grab a free weight in your other hand and perform a row motion, pulling the weight towards you and pinching your shoulder blade back. -After the sets on the right, switch sides and perform on the left. Remember, there are BOSU ball exercises for your entire body. If you are looking for core exercises, or different ways to strengthen your legs, please check out those pages through the links below.